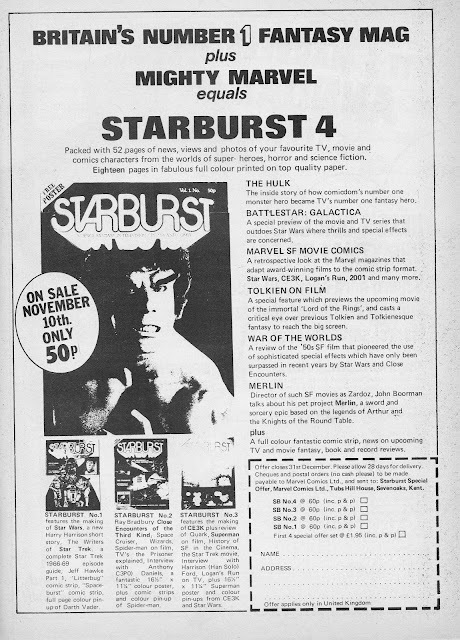 Here's a MARVEL UK house ad, from November 1978, heralding the arrival of STARBURST MAGAZINE into the Mighty Marvel Magazine ranks. 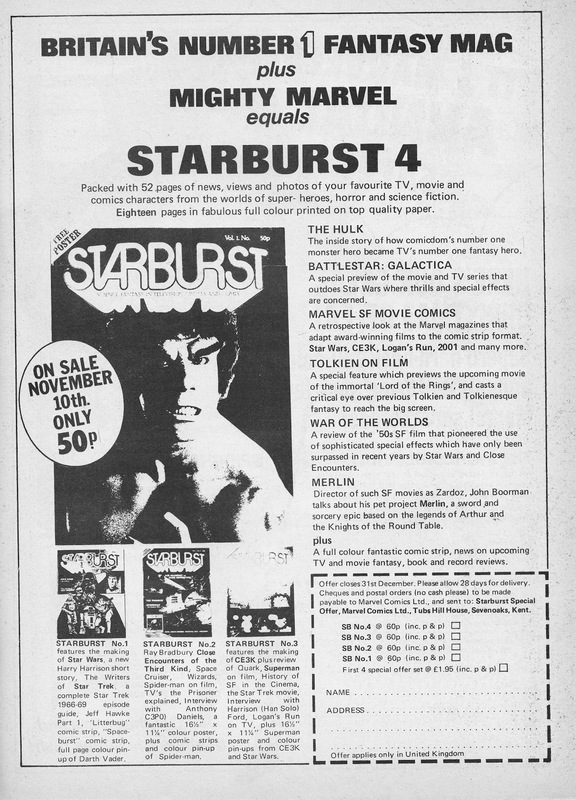 When Stan Lee recruited Dez Skinn to head the UK operation, he also acquired Dez's just-launched SF/ Fantasy magazine as part of the deal. Dez didn't last long (he was shown the door, by mutual consent, in 1980) but his magazine lasted longer. Marvel eventually grew bored of it in the mid-eighties and sold it on to publisher Visual Imagination. They turned it into something of a cash-cow, spawning numerous spin-offs, until the age of the web finally overtook them. The magazine's been revived in recent years and its great to see it back on WH Smith's shelves. Welcome to STARLOGGED! It's a repository, and celebration, of Geek Media (mostly print) from the 'Star Age': that pre-millennial period between, roughly, 1972 (the opening of Marvel UK) and 1999 (the release of The Phantom Menace... and the end of innocence). But, of course, we'll bend the rules when we want to. I only reproduce long out-of-print items for historical reference. I don't include anything that's currently in-print, is likely to be reprinted or otherwise commercially exploited by the copyright holder. Comments and contributions are most welcome.